We were in our back yard when an unfamiliar sound caught our attention. 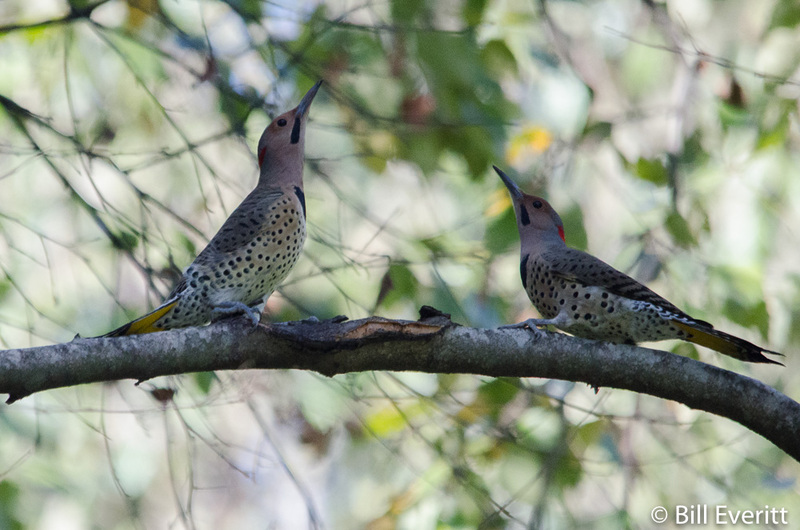 We spotted two beautiful Northern Flickers facing each other and waving their beaks, which were pointed upward. Checking Cornell’s site, ‘All About Birds’ we read that we were watching a ‘fencing duel’ intended to impress a prospective mate. Here’s what Cornell says about this interesting behavior. We heard the calls and observed the pair drawing figure eight patterns in the air. According to Cornell it’s a little late in the year for this behavior. So we posted a question to Georgia birders via GABO and got back three very thoughtful and informed replies. One reply from a birder in Lawrenceville said that ‘Right now the sun is at the same angle as it would be around early March. The angle of the sun stimulates hormone production in birds, which leads to fencing, singing, etc. It is not atypical to see some breeding-type behaviors in the fall, the birds are just getting a little false alarm. Second thought that comes to mind is they were working out a territorial dispute, probably related to food resources.’ Excellent – we very much appreciate the information – thank you! We did manage to get a video which is pretty low quality, but since you can at least see the fencing behavior, here it is. This entry was posted in Bird Mating Behavior and tagged Northern Flicker on October 17, 2015 by beveritt.